TMS RADical WEB, preferred error handling? With almost all in the TMS development team and since some time also many TMS ALL-ACCESS users busy using TMS WEB Core to develop web client applications from the Delphi IDE, we wonder about what could be the preferred developer experience to deal with run-time errors? A Delphi code exception is for example an out of bounds access in an array. A DOM error is for example accessing a non-existing attribute of a HTML DOM element or a network error. The standard behavior in the browser is that the error is displayed in the console. To see the error, the developer needs to open the console (for example with the F12 in the Google Chrome browser). When not looking in the console, errors go in many cases unnoticed. As a software developer, we're interested in all sorts of errors so we can locate the cause and apply fixes to avoid the errors. From the feedback of several users already busy with TMS WEB Core, we learned that in many cases an unexpected behavior is reported but it is overlooked to look in the console to get more details about what exactly might have happened. This made us reflect on how we can do better to make it clear to developers that an error happened in the web application. There are several possibilities and perhaps there are even more we didn't think about yet. Advantage is that it is blocking and thus can't be ignored but the position of the alert is controlled by the browser and somewhat awkward. Disadvantage is that we need to click the dialog away for every error that happens. Advantage is that it is centered in the window and cannot be misinterpreted that it concerns an error. Disadvantage here is also that we need to click the dialog away for every error that happens. Advantage is that it is less intrusive and the red colored area can host multiple errors simultaneously when it grows. This is far from trivial but we have some experimental code & proof of concepts that could make this perhaps in the future also a feasible solution. Perhaps there are other possibilities we didn't think about yet, so we're curious to hear your thoughts! We had some internal discussions with the development team here and there are different opinions. So, therefore, we wonder what your thoughts are and what you think is the preferred way to handle errors for your Delphi web client applications. Note that the default behavior could even be different in DEBUG mode from RELEASE mode. Hi, the application with webcore will available for convert phonegap app to run in android or IOS ? It''s pure HTML/JS/CSS that is generated, so technically should be feasible. It''s on our todolist to validate all that. We''ll inform when we have validated. I think having a browser side application object that you can decide which and add your own would be best. AnEnum for which one - my general dev one would be a non-obtrusive red box, non blocking on the browser, but would also like the option of callback to the web server, so can be surfaced in the IDE or some app console giving you an opportunity to save them server side. 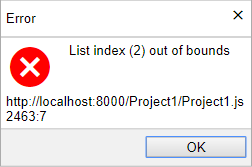 How do other frameworks like Angular, Vue etc handle this kind of errors? Perhaps there already is some form of common approach we could borrow.